Spring can be very stressful for birdwatchers; just when you think the warm weather is breaking through, another cold front passes by and drops a little more rain on us. In many ways though, this makes spring more fun, as small pulses of migrants work their way north during the clearer spells of weather, interspersed with breaks in activity. At this time of year it is good fun to have a 'local patch' that you visit as regularly as you can and watch how migrant numbers vary from day to day - at times even hour to hour. The Western Tanager that turned up on Sunset Boulevard last week has not been reported since March 27th so it may have moved on; on the same day, I was surprised to see the Louisiana Waterthrush back on the Northwood Center Pond. Pine Warblers continue to trickle in, with one or two reported from backyard feeders at Cape May Point and numbers now building up in Belleplain State Forest. On 30th, one was feeding on the ground, right out in the middle of a farm field on Bayshore Road - migrants can turn up in strange places! On 27th, a Glaucous Gull was reported from Bivalve in Cumberland County and numbers of shorebirds are growing on the impoundments at Heislerville. An adult Little Gull was at Miami Beach on 27th and 28th and at least one of the male Common Teals at the state park was still present on 30th. Laughing Gulls don't take long to build up in numbers once they decide to head north and, though I only had my first of the year in Cape May County on 29th, the next day I discovered that at least 2000 were at the main breeding colony near Nummy's Island. The two male Blue-winged Teal that have been wintering at the state park are not so lonely now, as small parties of this species begin to trickle thruogh our area. At least 15 can now be found around the state park/meadows area, while Ospreys have wasted no time in heading straight for their nesting platforms and many pairs are doing post-Sandy repair work now. Tom Magarian reported a migrant Little Blue Heron in Villas on 30th and Tom Reed reported a Northern Rough-winged Swallow at Stone Harbor Point the same day. Great Cormorants have been present in good numbers this past few days, with our Friday morning Higbee Beach walk providing us with a nice party of five of these chunky birds, including three adults in full breeding plumage. The Higbee fields currently have a nice selection of Eastern Bluebirds, Eastern Phoebe (at least four on Friday), Field Sparrows, Gray Catbirds and Brown Thrashers - from now on it gradually gets better and better!! The back bays and beaches are gradually livening up as Forster's Terns and Laughing Gulls return from wintering grounds further south. Notice the variation in head molt in the Forster's Terns at this time of year - always something to be wary of when looking for something different among the commoner birds [photo by Mike Crewe]. Dunlins have wintered with us in good numbers, but keep a watch on shorebird flocks from now on as birds gradually acquire their breeding plumage and become just a little bit more colorful day by day [photo by Mike Crewe]. Looking right back at you! Ospreys are just impossible to ignore right now as they stock up on local fish after a long journey back to Cape May from the Caribbean or South America [photo by Mike Crewe]. While we all know that Cape May is the center of the universe (only kidding guys!! ), there has certainly been good birding a little further afield this past week, as well as down here at the cape. 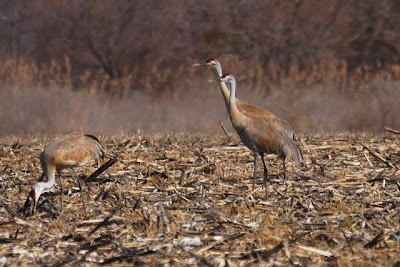 Salem County has been providing some great birding along Featherbed Lane and around Mannington Marsh of late, with the resident Sandhill Cranes readily viewable in the Mannington marsh area and a Yellow-headed Blackbird along Featherbed Lane. A Ross's Goose has also been hanging out with the large Snow Goose flock in the triangle formed by Kings Highway, Haines Neck Road and Rt 540. 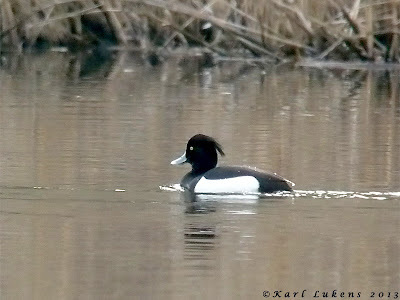 At Parvin State Park, just west of Vineland, a male Tufted Duck has been present since 22nd with Ring-necked Ducks on Thundergust Lake, accessible off Parvin Mill Road. Closer to home (for me anyway), the Louisiana Waterthrush continued today on the little pond at the Northwood Center, while our Wednesday morning walk provided us with four Ospreys, 10 Blue-winged Teal and the male Common Teal, still present on the North side of Lighthouse Pond West in the state park. 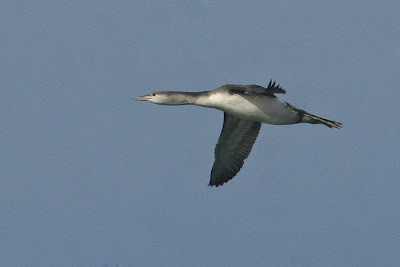 The Northern Gannet, Red-throated Loon and scoter show continues unabated offshore - for a report on last Saturday's Poor Man's Pelagic, see Karen Johnson's piece on our Field Trips blog. A few Pine Warblers continue to move through the point and one joined the Western Tanager at a feeder at the north end of Lighthouse Avenue this morning. A scattering of Piping Plovers continue to be reported from sandy beaches, with one at Sunray Beach, Del Haven on 23rd and five at Brigantine Island on 24th (where there was also a Laughing Gull and at least 10 Willets the same day). The Tundra Swan put in another appearance at The Meadows on 22nd after a bit of an absence and two Orange-crowned Warblers continue to lurk in the state park. A Solitary Sandpiper was reported from Heislerville on 23rd. This male Tufted Duck is drawing the crowds to Parvin State Park right now [photo by Karl Lukens]. 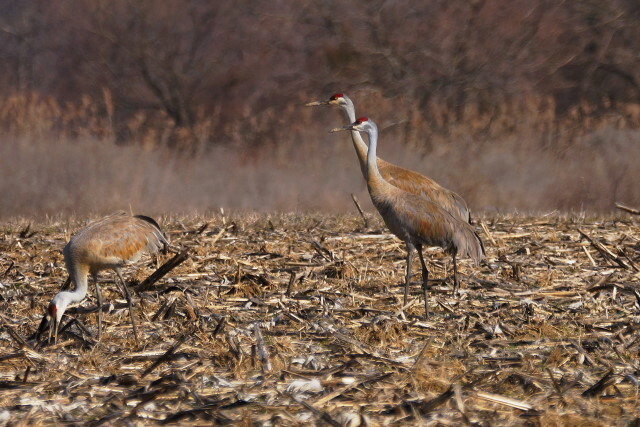 Sandhill Cranes near Mannington Marsh this week [photo by Jeff White]. Pine Warblers are returning to our area now and many of the early birds are colorful males like this one. Keep an eye out for them at feeders over the next 10 days or so [photo by Karl Lukens]. 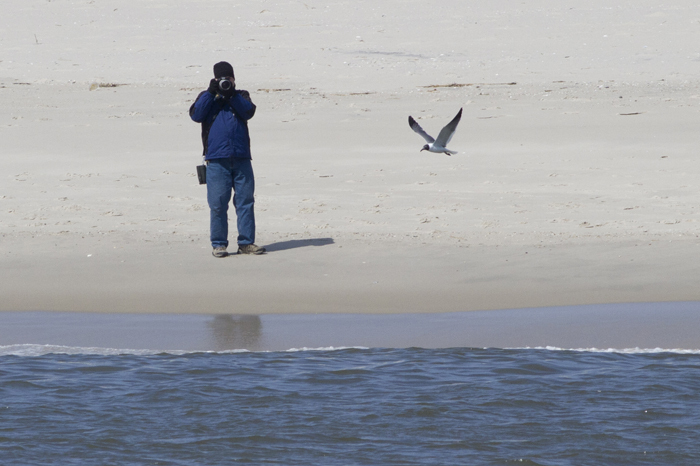 Watching you watching me... a birder gets a close encounter with his first Laughing Gull of the year. Sam Galick took this photo from the Cape May Whalewatcher as it passed Cape May Point. 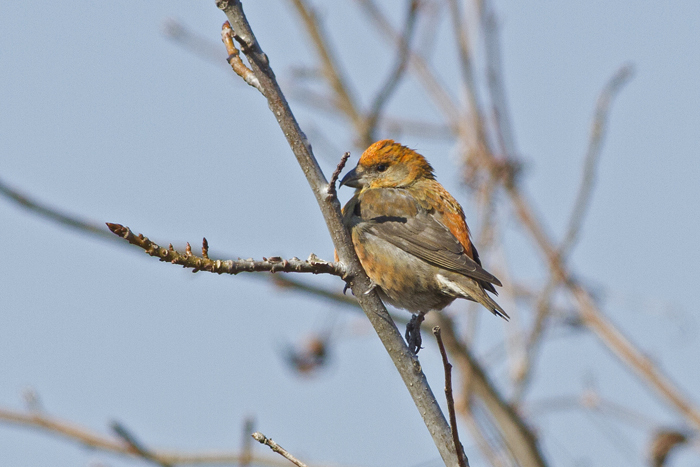 Though they hung on well into their breeding season, Red Crossbills seem to have slipped quietly away from our area and are becoming very hard to find now [photo by Sam Galick]. A female Western Tanager has been hanging out at a feeder on Sunset Boulevard for a few days now; we were waiting for the owners to be in residence before checking with them that it was OK to broadcast the news, as this is a busy road in a residential area. The bird is visitng a feeder in the back yard of the last house on the left (south) side of the road, just before you reach Lighthouse Avenue. Though the feeder is in the back yard, it is viewable from the street. The owners have a dog, so if you see a light metal fence across the driveway, do not enter the property as the dog is excercising in the yard. If there is no gate, you may walk in as far as the house to view the feeder closer. But please respect people's privacy here. With the long-staying Cape May Court House bird already on many people's year lists, I guess this won't be too big an issue. Female Western Tanager at Sunset Boulevard this week [photo by Mike Crewe]. The Louisiana Waterthrush continues to feed gymnastically on the small pond on the east side of the CMBO Northwood Center on East Lake Drive [photo by Mike Crewe]. It really is a topsy turvy month so far, but the forecast looks great for Saturday, when we have plenty for you to enjoy down here at the cape. One of the most popular of all our various boat trips is the Loons and Shorebirds Cruise, the first of which comes up this Saturday. Running from 1PM to 3PM out of the Miss Chris Marina, this trip focuses on the loons now gathering in the backbays before heading north, and the first incoming shorebirds which are now arriving here. You are also likely to have a good opportunity to enjoy Horned Grebes, now-arriving Ospreys and a good range of ducks, most of which are in full breeding regalia now. To avoid disappointment, it is best to pre-register for this trip by calling our registrar on 609-861-0700. It may be possible to catch the boat without pre-booking so, if you are heading down last minute, do call The Osprey on 609-898-3500 to be sure of a place. The weather forecast looks excellent for Saturday, so come and treat yourself to an early season, backbay experience. Long-tailed Ducks are fabulous birds and small parties can still be heard calling away and courting in the backbays now, especially around the inlets. Head out with us and benefit from local knowledge as we head out into the calm waters of the back bays [photo by Marvin Hyett]. Talking of it being a topsy turvy spring, it was kind of weird to see the birds at the Northwood feeders in the snow yesterday, especially as the Louisiana Waterthrush was still here and no doubt wondering where it took a wrong turn! March is always a tricky month for birds; the weather is unpredictable and food availability is at the lowest it will get all year. So it's a good time to feed birds, as well as a good time to be out seeing what's going on in the wider world - every day has a surprise in store now as spring gradually creeps up on us. ... but a Black Vulture standing on ice is certainly something you don't see every day! Black Vultures have been expanding their range northward for some years now, but it is still a species that largely favors warmer climes and I am sure that our local birds were really not happy yesterday [photos by Mike Crewe]. Though there was some patchy ice this morning attesting to a chilly night, sunny skies gave a fine spring feel to our first Wednesday walk at the state park for 2013. Though the ponds at the park now only hold a sparse scattering of ducks, there was nevertheless plenty to look at, with quite a few Lesser Scaup still present, a couple of female Buffleheads, four Ruddy Ducks and small numbers of most of the usual dabblers. But, though the ponds were quiet, the offshore rips were pretty busy; small parties of Black and Surf Scoters ferried back and forth and there was a steady passage of Red-throated Loons and Northern Gannets heading into the Delaware Bay. A single Horned Grebe and a couple of Common Loons also passed by and an American Oystercatcher was a nice early-season bonus. Migration was clearly in evidence too as we watched a party of 17 Great Blue Herons beat their steady way in over the water and onward behind the lighthouse. On the state park trails, signs of spring came in the appearance of three Pine Warblers, all smart yellow males and all busily feeding on insects among the Pitch Pines. Perhaps the biggest surprise was a Wild Turkey which called several times from somewhere near the park entrance. Single birds occasionally wander down to the point and are probably individuals that have been separated from the local flock during the hunting season, but it is still always a surprise to come across one down here. Later in the day, some welcome signs of spring continued with an Osprey hunting over Lake Lily. This was shortly followed by a complete surprise for me when I found a Louisiana Waterthrush on the tiny, three-foot long pond at the front of the Northwood Center! From a quick look at the published records, this may well prove to be the earliest ever recorded in Cape May County, equalling the date of one found in Cumberland County in March 2012. You really never do know what you are going to find in the coming weeks, as birds hasten their way northward. Recent lingerers include the male Common Teal at the state park and Tricolored Heron at Nummy's Island (both present to 16th at least), Cave Swallow at The Beanery and Orange-crowned Warbler at the state park (present to 17th and 18th respectively) and the two Eurasian Collared Doves still hanging out in the Whilldin Avenue area at the point. An American Tree Sparrow was reported from Strawberry Avenue, Bivalve (Cumberland Co.) on 17th, which is particularly notable this year as there were very few sightings at all of this species in our area this winter. Back on the 16th, Tom Reed sat out a migration vigil at the point and tallied a few inbound migrants, including 15 Wood Ducks, 24 Great Blue Herons, eight Great Egrets, 21 American Oystercatchers, one Eastern Meadowlark and four Pine Warblers. 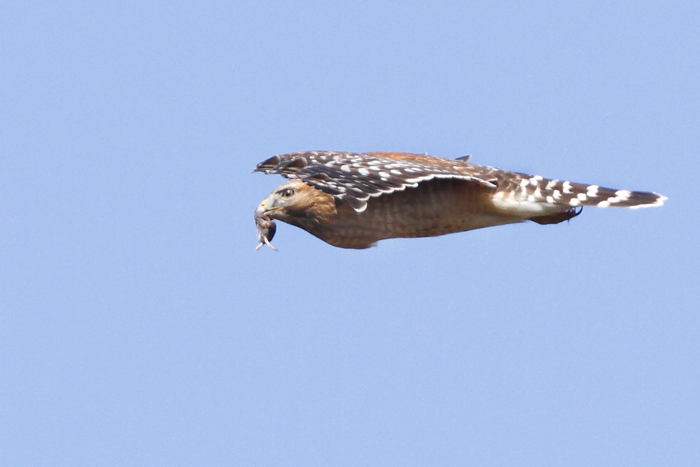 Most intriguing, perhaps, this week have been a couple of reports of Broad-winged Hawks (perhaps both relating to the same individual) from first Cape May County then Atlantic County. Though winter/early spring records of this species are not unheard of, they are still pretty rare here at this time of year, so do keep an eye on the skies! Osprey over Lake Lily today; these birds are moving up the east coast in good numbers now so keep an eye out for them on nesting platforms along the backbay marshes [photo by Mike Crewe]. 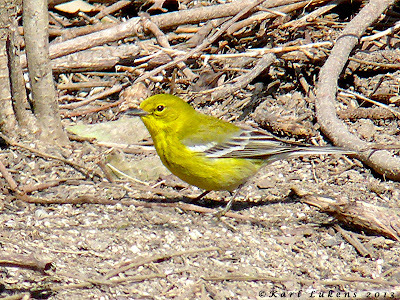 Male Pine Warbler at Cape May Point State Park - one of three seen on our regular Wednesday walk today. 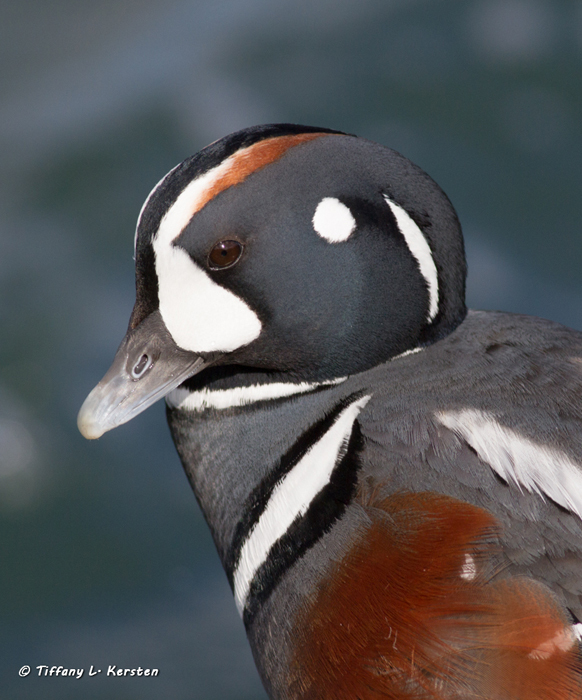 As with many migratory birds, males tend to arrive a little ahead of females in the spring [photo by Mike Crewe]. A nice bonus for my office window list - a Lousiana Waterthrush at the Northwood Center today. Compared with the more common Northern Waterthrush (around here at least!) note the heavier bill and overall colder color tones of this bird, as well as the unmarked throat and relatively sparse streaking below. This species is a much earlier migrant than Northern Waterthrush, the latter pushing much further north into boreal forests a good month or more later. Louisianas will be arriving on breeding grounds in Belleplain State Forest over the next 10 days or so [photo by Mike Crewe]. The timing couldn't be more perfect - Northern Gannets are arriving in the Delaware Bay now, just in time for our 'Poor Man's Pelagic' aboard the Cape May-Lewes Ferry this coming Saturday. Come and join us and see if we can continue our track record for some spectacular gannet and loon experiences - as well as the chance of some migration surprises. Click here for more details or call us on 609-861-0700 [photo by Mike Crewe]. Close encounters with Red-throated Loons are often a specialty of our Poor Man's Pelagic trips across the Delaware Bay. Come with us and learn how to pick them out from Common Loons [photo by Mike Crewe]. A variety of mammal species have featured in the photos that I have been sent recently, as well as in my own life and this is certainly a group of animals that tends to be a little more noticeable at this time of year. Very few mammals actually go into a full hibernation, but Woodchucks and bats are among those that do so locally and it is around now that we start to see them reappearing after their winter slumbers. Such individuals can be rather sluggish, so do keep an eye out for things inadvertently wandering out into the road; also keep an eye out for anything wandering into your yard - you might get a few surprises! A few days ago, Karen Johnson called me to tell me that her husband, Brian, had just seen an American Red Squirrel on Jakes Landing Road. Though this is a widespread species in North America, it does not appear to be common in Cape May County and has perhaps even declined in recent years, so it is a nice animal to see in these parts and the first that Brian had seen for some years. This weekend I saw my first chipmunk of the year, busily out and about, and last week I saw a Meadow Vole scurry through the grass at Nummy's Island. Meadow Voles often live in low lying areas that can be prone to flooding so they can have a tough time of it; this species almost certainly accounted for a high percentage of the large small mammal mortalities noted along the Delaware Bay after flooding caused by Hurricane Sandy. It is as a strategy to survive such events that this species has become perhaps the most prolific mammal on earth, with captive individuals found to be capable of producing 17 litters in a year! River Otters have been reported from Cape May Point State Park and along Reeds Beach Road this past week, so keep an eye out for them in lakes and ponds if you are out and about over the coming weeks. Finally, I had a dark, fluttery thing go past my office window today and further investigation revealed a dark species of bat which settled on nearby vegetation. A quick investigation revealed it to be one of the more easily-identified species - a Silver-haired Bat. This is a species I had not knowingly seen before, though who knows what half those silhouettes are that we see during the summer! Silver-haired Bats are widespread and common but, like most bats, not easy to observe most of the time. This individual was on the wing at 4PM so may well be another beastie coming out of hibernation for the first time and looking for a good meal to get it on the go again. If you're looking for mammals, don't forget to keep an eye out for signs of their presence as these are much easier to find than the animals themselves; look for footprints in sand or wet mud or keep an eye out for the remains of meals - many small rodents can be tracked by the distinctive way that they open acorns and other nuts for example, while the fishy remains of an otter's last meal can also be a distinctive give away. Often, all you will see of a River Otter will be a big, bewiskered head, watching you from the safety of open water. The heads of these animals are much larger and grayer than the heads of the more common Musk Rats. 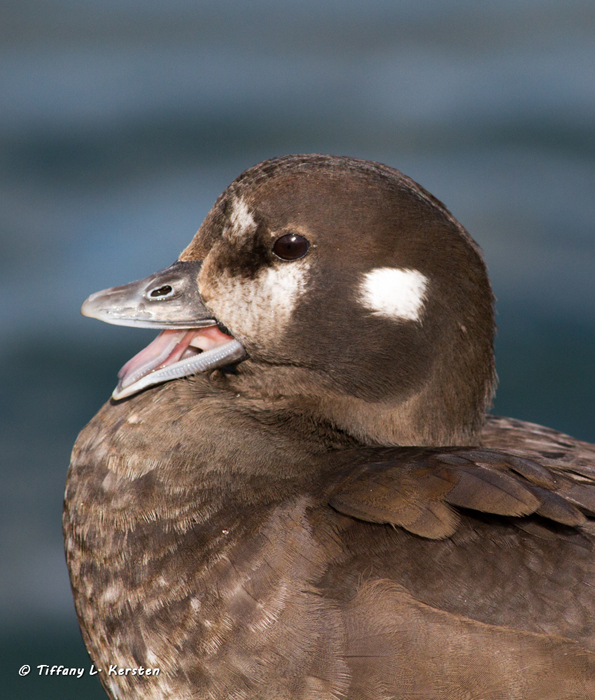 This individual was photographed in Lighthouse Pond recently [photo by Mike Crewe]. If seen well, Silver-haired Bats are readily recognized by being overall dark blackish brown. The hairs on the body are tipped whitish, giving it a frosty look and the ears have a diagnostic pale area toward the base. Like all small mammals, bats' only defence is to bite, so you should never handle them without strong leather gloves as they can occasionally carry rabies [photo by Mike Crewe]. 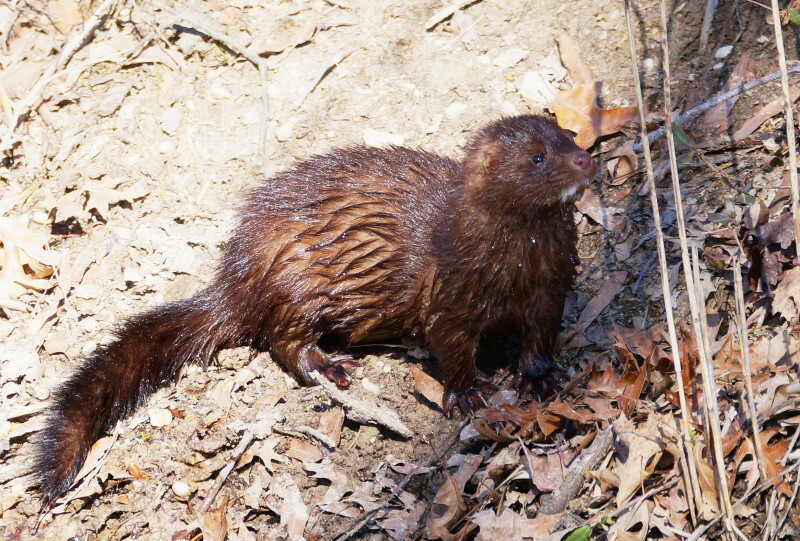 This American Mink was photographed recently in Salem County. Predatory mammals such as this tend not to hibernate, but might lie up for several days at a time if the weather turns nasty [photo by Jeff White]. I took another opportunity today and it paid off! With spring edging up on us a little more each day, every stolen opportunity has the power to produce results. I took a stroll at the Rea Farm this lunch and was rewarded with a group of seven Tree Swallows and another swallow - a smaller, stumpy-looking thing with a squared off tail. In spring, first thoughts of such birds automatically turn to Cliff Swallow and I ran riot with the camera, not really looking too hard at the bird, but concentrating on keeping it somewhere vaguely in the field of view! When I got round to downloading the pictures I was in for a surprise - the bird turned out to be a Cave Swallow! Cave Swallows have been increasing as a late fall visitor to Cape May in recent years but this remains a very rare spring bird here and it perhaps seems likely that this bird arrived on the east coast last fall and spent the winter somewhere down in the south-east. Tree Swallows are usually the first of the swallows and martins to arrive back in spring and it is always worth checking your local pond for their arrival in the next few days. If you find any, have a good look through to see if you can spot anything different. Cave Swallow at the Rea Farm today. Note the rusty (not white) forehead which rules out Cliff Swallow. The gray wash to the flanks and relatively pale orangey rump suggest this is a Texan bird and not a Caribbean one, which is probably to be expected [photo by Mike Crewe]. Head on, the orangey flush to the forehead is obvious on a Cave Swallow, while the tail shows just a shallowly notched tip, which looks square-ended when fanned out. Note too, the lack of a dark patch on the chest [photo by Mike Crewe]. For comparison, here's one of the Tree Swallows present today; note the all white underparts (including the throat) and the well-notched tail [photo by Mike Crewe]. Today was one of those days when it paid to be a real birding geek and make sure I always had my binoculars with me. Even on the busiest of days, a ray of light can come into your life when a chance encounter with wildlife serves as a welcome break. Traveling in to work this morning, I found myself breaking very suddenly when a large, black shape appeared in my peripheral vision to the left of the car. Right at windshield height, a Wild Turkey hurtled across the road and headed for The Beanery parking lot! This was quite a moment since this is a pretty scarce bird down here south of the Cape May canal, except for a small band of birds that hangs out along New England Road, toward Higbee Beach. My next pleasant moment came shortly after when I gave Sunset Beach a quick check from the car; here, small parties of Black and Surf Scoters were ferrying back and forth, giving a clear signal that the spring build up in the Delaware Bay was finally starting in earnest. Red-throated Loons were starting to gather too and I am sure it won't be long before the Northern Gannet show starts. One more treat was to come to me in a fortuitous way, for my car went in for an oil change and check-up today. On the way in to pick it up lunch time, I stopped by for a quick bite at Warren Cairo's house and discovered that our local Osprey was back on its nesting platform on Cape Island Creek. See, even taking your binoculars to the garage is worth while! Actually, under the heading of 'once a naturalist, always a naturalist', I can also reveal the following. When I read through the bill to see what I was paying for at the garage, I discovered the following: "Replace air filter, cabin air filter, wiper blades, remove animal nest from engine compartment". Marvellous! 'Chaseable' birds have been a bit thin on the ground of late, which is rather more typical in spring than fall, as birds are in more of a hurry to head north to breed now than they are in the fall when they are making their way south. At least two Common Teals continue at Cape May Point State Park and at least one Golden Eagle is being reported regularly from Corbin City Impoundments. A few Black-crowned Night Herons are being reported here and there, some of which may be new arrivals, while the Tricolored Heron remains at Nummy's Island. Nummy's Island also has a nice collection of sparrows at the moment, with Nelson's, Sharp-tailed and Seaside Sparrows all lurking in cover along the road edges and a flock of 20 or so Savannah and Song Sparrows currently holds at least three 'Ipswich' Sparrows. Migrants in a hurry this week have included Tree Swallows at Tarkiln Pond on 10th (always a good place to watch this time of year), Iceland Gull and Eastern Phoebe northbound at Avalon on 11th and a Red Phalarope southbound at Avalon on 12th. I have heard through the grapevine of at least two other Laughing Gulls this week and two Snow Buntings seem to be hanging out still at South Cape May Beach, but are very elusive. Keep your ears switched on in the evenings now, as the frog chorus is gaining volume nightly; so far, I have heard Chorus and Southern Leopard Frogs at a number of locations and the deafening madness of Spring Peepers is pretty difficult to miss now! Butterflies should be sought with the weather warming too, and there is certainly a good scattering of Mourning Cloaks on the wing now. The overall pale colors of 'Ipswich' Savannah Sparrows often make them stand out more obviously when seen against a backdrop of twiggy bushes. With an estimated world population of around 6000 individuals, the total of six birds that we saw at Stone Harbor and Nummy's Island on Monday could represent 0.1% of the entire population [photo by Mike Crewe]. A careful, quiet approach is required to get up close and personal with any of the marsh sparrows. This Saltmarsh Sparrow shows typical heavy, dark streak on a whitish background below, contrasting orangey face and dark streaks in the supercilium [photo by Mike Crewe]. This Nelson's Sparrow was one of four with two Saltmarsh Sparrows (see photo above) on Nummy's Island on Monday. Compared to the bird above, note the paler orange face, which matches the orangey wash on the breast. 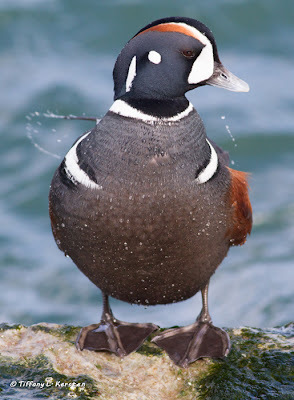 Note also the more subdued streaking below and the lack of dark marks in the supercilium [photo by Mike Crewe]. Parties of Eastern Meadowlarks are scattered in Cape May fields at the moment. These birds were part of a flock of at least 20 at The Beanery last weekend [photo by Mike Crewe]. A closer look at an Eastern Meadowlark, showing its wowy yellow belly [photo by Mike Crewe]. A great sign of spring that often goes un-noticed right now is the courtship flights of Fish Crows. Spread back over our area from their discreet wintering spots now, these birds present a wonderful sight as pairs and small groups perform aerial displays, where they fly around with slow, exagerated wingbeats, the pairs often mirroring each other's actions. During this behavior, I find that their profile looks much more like that of American Crow than they usually do when in typical flight, and their distinctive nasal calls are all the more useful - luckily they call a lot when courting! [Photo by Mike Crewe]. Warming up in the cabbage patch. Les Rea's crop fields provided a lovely sheltered spot for these Turkey Vultures to catch the sun this week [photo by Mike Crewe]. Spring, spring, spring! Mourning Cloaks over-winter as hibernating adults and are one of the first butterfly species to be seen in spring. Look out for a dark, blackish-brown butterfly with a narrow, creamy border to each wing, basking in sunny, sheltered spots [photo by Mike Crewe]. Late February or early March is the perfect time to cut meadows and fields, so if you are gardening for wildlife, or simply trying to put back a little of what we have lost in Cape May, then there's still time to get the mower out and make that annual haircut. Many of our open areas in the county are being swamped by alien shrubs and grasses, but a single cut made at this time of year seems to be the best way to knock them back and to encourage native species. In my own yard, in just three years, I have converted a mish-mash of alien grasses and 'weeds' into an area dominated by native Virginia Beard-grass and Frost Aster, just by doing a single cut a year at the right time. A little bit of work has been needed to remove some persistent Multiflora Rose and Silktrees, but otherwise, it's pretty much maintenance free - which is always good news! While doing the mowing just recently, it struck me that this is the ideal time to thin out two persistent and potentially damaging alien invaders - the Chinese Mantis (Tenodora sinensis) and the closely-related Narrow-winged Mantis (Tenodora angustipennis). It's a good time to thin them out because their overwintering egg cases (technically called an ootheca) are fairly obvious, attached to dried plant stems and low bushes like light brown pieces of styrofoam. As with most introduced species (deliberate or otherwise) these large, voracious insects readily cause problems in a balanced ecosystem and native fauna will not have evolved to deal with them. While we do have a native mantis over much of the eastern US, it is a smaller species and not able to take on some of the larger insects that the Asian species eat so readily. The really big problem with these introduced mantids is that they are readily sold mail order, not only as a pet, but as so-called 'pest control'. I read a number of websites recently that made a number of remarkable, and often contradictory, claims about these beasts. While I am sure they are capable of eating some pest species (and what one person considers a pest another may not), I have little doubt that they also eat many beneficial insects - in fact I know they do because I've seen them doing it!! Claims that they eat a lot of cockroaches seems a bit far fetched, since roaches live in houses not backyards - maybe you're supposed to keep mantids in the kitchen! When at the early growing stages and thus quite small, the mantids probably do eat a certain number of aphids, but these can be controlled quite easily by maintaining a healthy, balanced garden that has plenty of habitat for birds to nest, and for natural predators such as ladybeetles. Chinese Mantis (Tenodera sinensis) eggcase. The cases of this species are well-round, almost globular in shape and bulge out obviously from the vegetation that they are attached to. 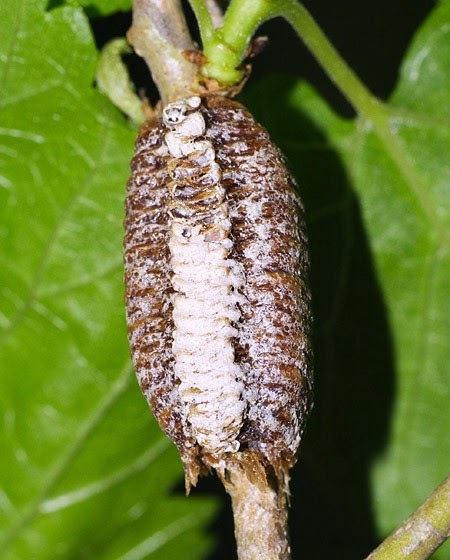 Egg cases of all species are about an inch long or a little more [photo by Mike Crewe]. Narrow-winged Mantis (Tenodera angustipennis) eggcase. In this species, the cases are elongate and don't bulge significantly from the stem. There is also a narrow groove running down the length of the case on the underside [photo by Mike Crewe]. Narrow-winged Mantis eggcases are often found in small clusters, like this batch of three on a low twig in Cape May Point State Park [photo by Mike Crewe]. Native Carolina Mantis (Stagmomantis carolina) eggcase. In this species, the cases are again elongate and don't bulge significantly from the stem. Though the cases seem to be variable, they most often appear to be darker than the cases of the Asian species, often dark honey-colored with a paler stripe [photo courtesy of Bug Guide, www.bugguide.net]. There is a third, introduced, mantis in our area, the European Mantis (Mantis religiosa). It is currently the least common of the three introduced species in Cape May County and its eggcases are most similar to those of Carolina Mantis. Indeed, the vast majority of photos on the web are so confused that I searched for photos taken in Spain to be sure of getting it right!! The eggcase above was photographed in a field in Erma, Cape May County and is identical to Spanish specimens. It seems to differ from the native species most obviously by its overall light tan coloration [photo by Mike Crewe]. There is much misinformation about mantids on the web and, in particular, many wrongly-identified photos of eggcases (and even adult mantids) so do take a careful look at the pictures above and try to leave any native ones you may find. Of course, if you do want to keep any non-native ones you find and raise them as pets, that can be great fun, but keep them in the house, not in the garden! ...and here, a Monarch butterfly. Adult mantids spend much of their time waiting for a meal at flowering plants, so butterflies often constitute a high percentage of their diet [photos by Mike Crewe]. When considering whether to buy mantises to control pests in your yard, would you listen to someone who stands to make money selling them, or someone who has taken time to study the ecology of the insects? Mantises are good at controlling cockroaches... Really? Well perhaps only if you release the mantises into your house rather than your yard, since cockroaches are not living out in your garden. Mantises control garden pests - so how does that work? Do you give them a field guide to read? Or do you consider butterflies, honey bees and beetles to be pests? OK, after my sunny disposition yesterday, it just had to go and snow today didn't it?! Yet again, March does its usual trick of swinging wildly from sunny to snowy then back again. A light dusting of snow covered the area this morning and flurries still continue, but it's mostly soggy stuff and not settling - and they're still forecasting sunny for tomorrow! Despite the hiccup in the weather, some interesting birds have been reported today and the northward push continues. Indeed, it seems almost traditional that many 'firsts' for the year are found on yucky days. This morning, Vince Elia claimed this year's LAGU Award with his photo of a very fed-up looking Laughing Gull at the ferry terminal. I'm sure it would rather be in Trinidad right now!! An Osprey put in an appearance at Lake Lily this morning, which was probably also a newly-arrived bird. The long-staying Cackling Goose was at the Beanery field on the north side of Stevens Street this morning, while a prize of some sort for finding a seemingly 'lost' long-stayer goes to Tom Reed who re-found the Townsend's Warbler yesterday, lurking just inland of the dunes at St Peter's. Also yesterday, a Short-eared Owl was reported hunting at Stone Harbor Point - a bird very much in short supply here this winter. Latest news from the Coastguard Base is that the male King Eider has shown up again, hanging out around Cold Spring Inlet with the two Common Eiders that had previously been at the point. Well wrapped up against the weather, I had an outdoor meeting with someone up at the Fort Apache section of the County Park South in Rio Grande this morning. As it turned out, it was a worthwhile visit from a birding perspective as we flushed a party of 12 Eastern Meadowlarks from the first field, and later I noticed a female Red Crossbill feeding on Sweet Gum fruits. Both Red and White-winged Crossbills seem to have taken readily to feeding on Sweet Gum fruits during the present southward irruption of these birds and it clearly shows that, despite their bills being heavily evolved to feed on conifer seeds, crossbills will readily feed on other seeds when they have to. Some years ago, I watched Red Crossbills in northern Norway, well beyond the tree line, feeding on dandelion seeds, while irruptions into the Scottish Islands often result in the birds feeding on thistle seed. Don't forget that this is still good raptor-watching time too. 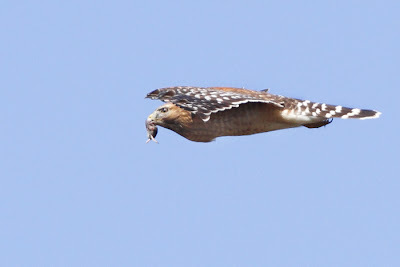 My yard this morning produced Red-tailed and Red-shouldered Hawks and a male Merlin in just five minutes, while a nice Northern Harrier was hunting the grasslands at Fort Apache. Now is also a good time to keep an eye on unusual visitors to your backyard feeder; if you regularly get grackles and blackbirds, keep an eye out for the off Rusty Blackbird among them, while before the month's end, there's a reasonable chance of you turning up your first Pine Warbler for the year. Well let's hope that the forecast holds good because, after the mighty blow of yesterday, it's nice to see that a sunny weekend is predicted. We know that March can be a bit rough at times, but generally we also know that winter is behind us and we can start thinking about warmer weather. Another milestone for the year comes with the changing of the clocks this coming weekend. Longer days to come and an upturn in the weather - what more excuse could you need for getting out on a Cape May workshop. Two of my favorite CMBO programs take place this weekend and, if you're quick, you could just squeeze in on a place on either of them. 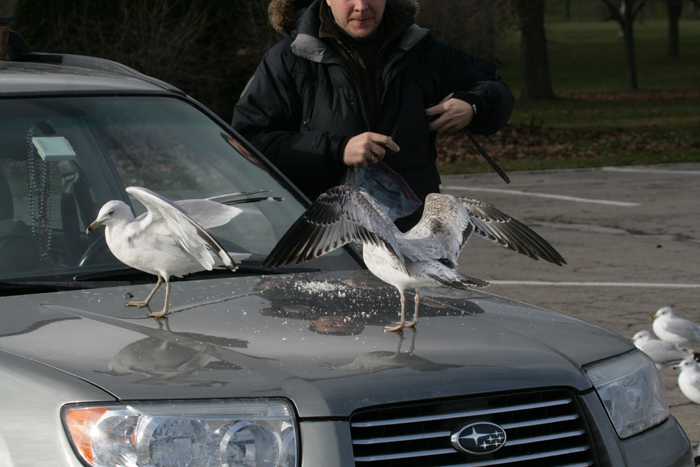 First up comes our regular Gulls Workshop, run by our local gull guru, Michael O'Brien. Gulls can be very confusing when you are trying to get to grips with them for the first time and even those of us who have been birding for longer, benefit from a few memory joggers from time to time. This workshop doesn't aim to confuse by swamping you with huge amounts of new information; Michael does a great job in focusing on one or two common species and teaching principles that can be applied to other species too. The second special program we have coming up this Saturday is the second of our Woodcock Dance programs for this year. The first program went very well indeed, with the indoor talk on the ecology of woodcocks being followed by a wonderful outdoor session, during which the local woodcocks performed perfectly for the band of gathered admirers. Come and make a Cape May weekend of it! Contact our Program Registrar for more information on these events by calling 609-861-0700. Clean, well-marked adults like this Ring-billed Gull can be easy to identify and provide a useful yardstick for measuring others against. Come and learn the 'tricks of the trade', or just top up your knowledge, ahead of one of the busiest seasons for gull movements here [photo by Mike Crewe]. Wonderful woodcocks! Ever wondered what that strange beeping noise is that you hear around dusk at this time of year? 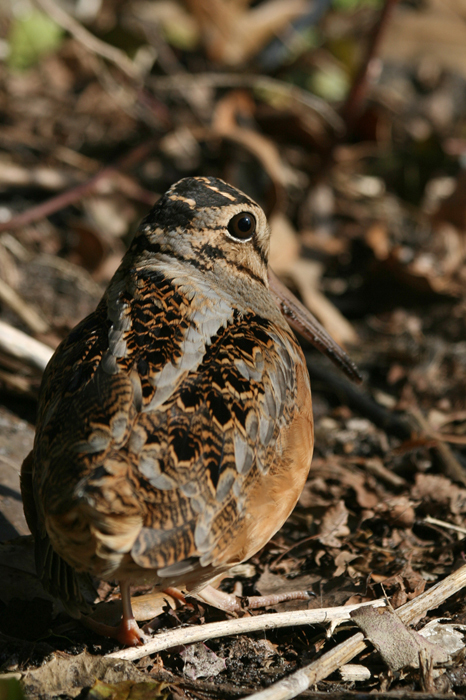 Come on our woodcock program and see for yourself [photo by Mike Crewe]. Some overwintering treats are still being reported around Cape May, including up to two Golden Eagles at Tuckahoe-Corbin City Impoundments, a House Wren and Orange-crowned Warbler in Cape May Point State Park, a Tricolored Heron in the Nummy's Island area and a Cackling Goose which wanders with the Canada Goose flock around Cape Island (recently most often seen around the Rea Farm or Shunpike Road areas). The Common Teal remains elusive but probably still present on Lighthouse or Bunker Ponds and Red Crossbills and Eurasian Collared Doves continue in the streets around Cape May Point. The little run of early Piping Plover sightings continued last week with two at Stone Harbor Point on 1st and 2nd and an Osprey was near the Wetlands Institute on 1st, continuing a run of sightings of this species this winter. If you are heading to the barrier islands in the next 24 hours or so, be aware that some routes may be temporarily closed due to flooding or fallen power lines after yesterdays storm. Being stuck indoors is never a pleasant experience for a naturalist, but as I look out of my office window and draw lots on when, not if, the trees outside blow down (and in what order! ), then being indoors is not such a bad thing. It really is a rough old day out there today. As I drove to work through Cape May this morning, it was sad to see just how much trash was blowing through the streets and scattering across the landscape, since Wednesday is collection day. If you're concerned about the environment as I am, you might consider not putting the trash out on the street if the forecast looks too windy; I always check the weather the night before and skip a week if it looks like it's going to be stormy - it's not difficult to do and does help our Cape May landscape. I also put it out on the morning of collection rather than the night before, that way, Reggie and Ronnie, our two resident Raccoons, don't turf it all out and make a mess in their own inimitable way (don't you just adore those lovable rogues?!). 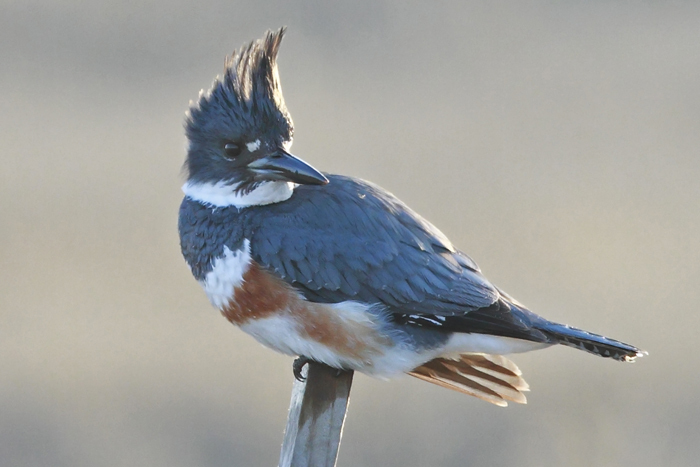 A small pond in Linwood has been favored by this Belted Kingfisher lately and a few conveniently-placed poles are offering it some useful feeding opportunities. Note the rusty chest band, that tells us this is a female [photo by EJ Nistico]. Here's a bird that features a lot less often here, as they have a habit of being far more skittish than the Purple Sandpipers. This Snow Bunting was on the jetty at Barnegat Light and, for once, decided to pose nicely [photo by Lisa Ryan]. Of course, it wouldn't be winter in New Jersey if we didn't keep you supplied with a regular dose of Barnegat Harlequin Ducks. These birds were designed with cameras in mind and rarely fail to please. Take time to let your subjects get used to you and you'll find it easier to win their confidence and get some great close-ups like these [photos by Tiffany Kersten].